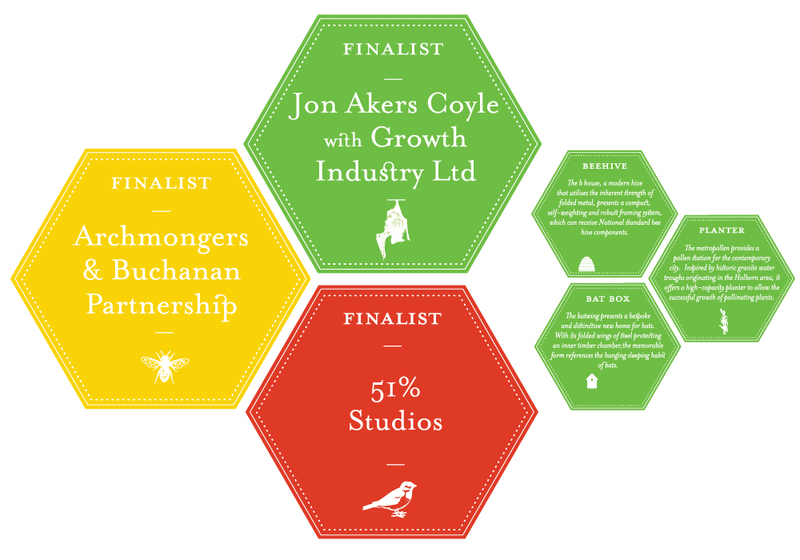 Commissioned by the Architecture Foundation, Inmidtown Habitats was an exhibition displaying three competition finalists of design prototypes for urban bee hives, bat boxes and planters. Our challenge was to design the exhibition in an empty retail unit at Central Saint Giles, Holborn, with all prototypes and information to be viewable from outside at street level. The project encompassed the design of an identity for the project as a whole, information on each of the practices and their entries, and to create a suitable environment or backdrop for the prototypes to be displayed and viewed from the street. Our solution involved installing cardboard honeycomb insulation as backdrops which were back lit, hanging posters and window vinyls using a coherent design but different symbols and colour coding to differentiate the practices and their entires. The identity was installed with an intricate cut vinyl, and vibrant vinyl birds, bees and bats drew the viewer around the large shop front toward the prototypes. An email invite and a feedback postcard, for members of the public to vote for their favourite concept, also mirrored the design.